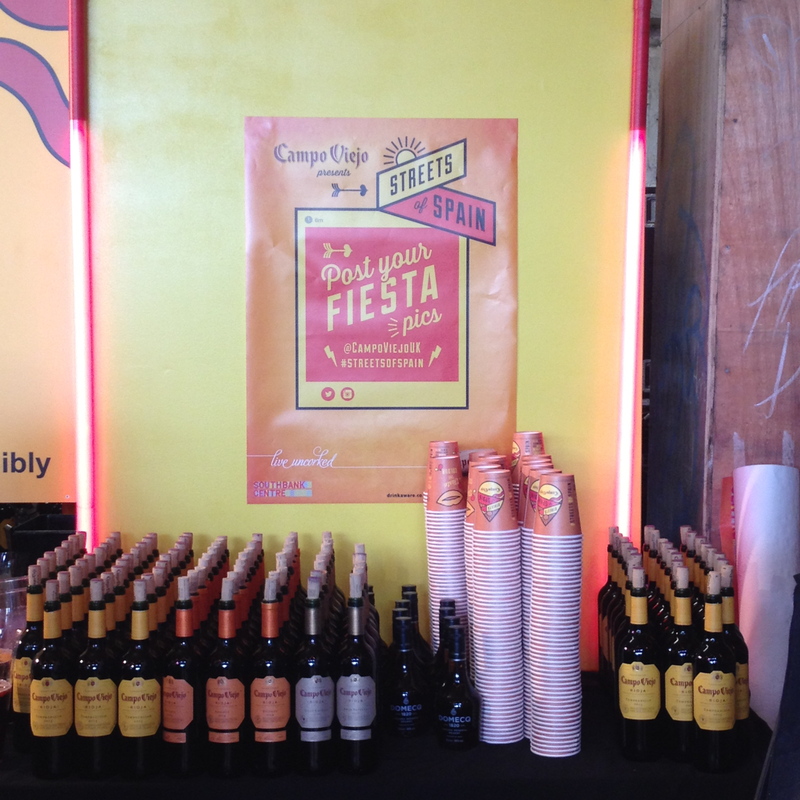 Billed as a multi-sensory Spanish fiesta experience, I decided to head out into the field with my psychology hat firmly on to judge for myself at the Campo Viejo’s “Streets of Spain” experiential event. 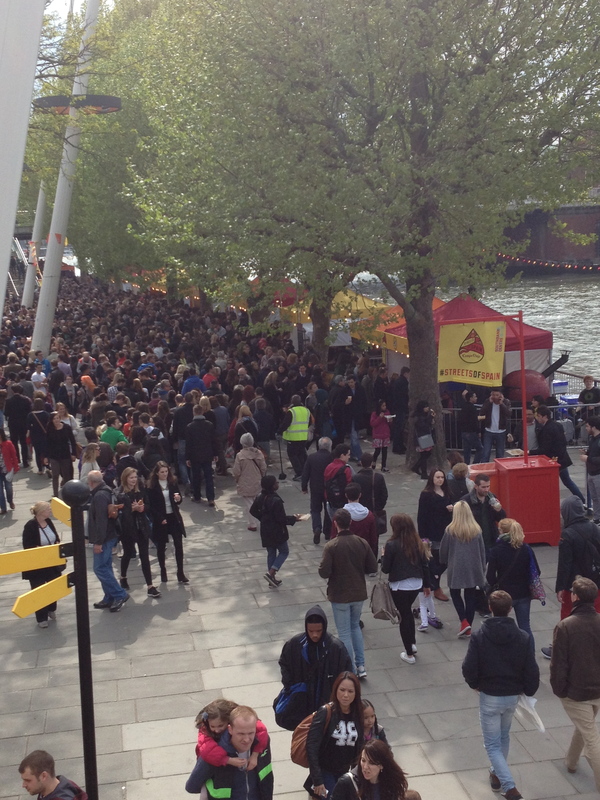 In its third year now, and boasting impressive stats from 2014, the festival kicked off with a bang on a cold May-Day Friday at the Southbank in South-East London. 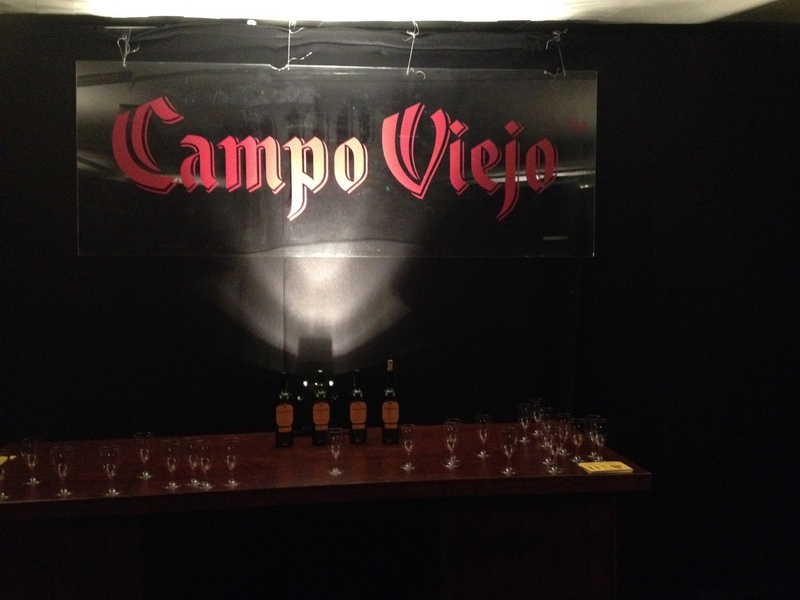 Miss Jones & Co were the agency behind the event, again trusted by Campo Viejo’s parent company, Pernod Ricard UK to deliver the goods. For the theme, food and wine took centre stage (unsurprisingly) with a sprinkling of art and music for extra spice. The first thing to hit your sensory pallet was the visual spectacle. 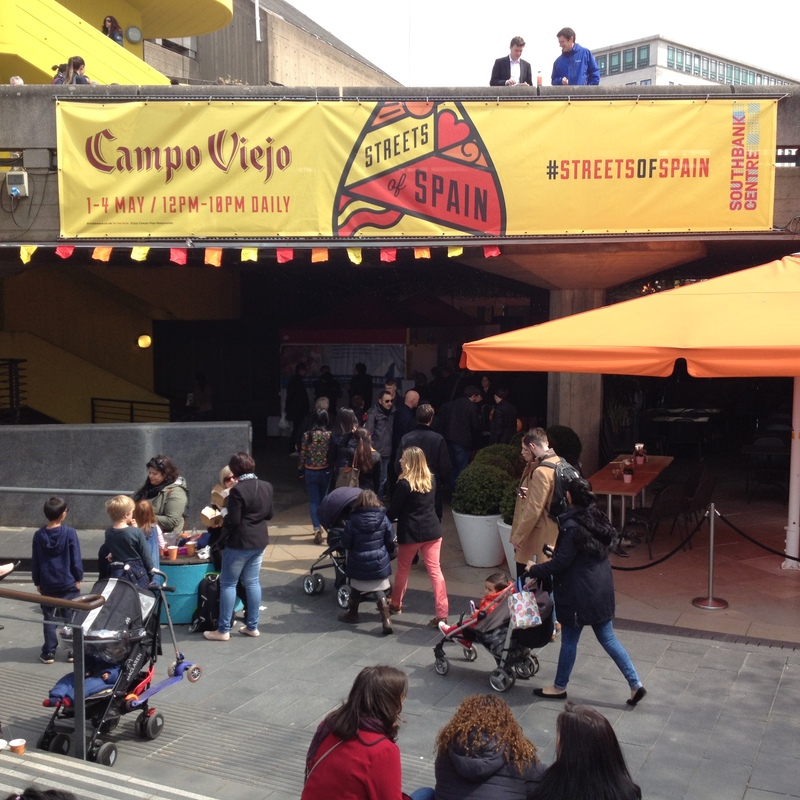 Spread out along the banks of the River Thames was an expanse of street food tents serving all kinds of tasty Spanish food — A sight for sore eyes, indeed. And each tent was branded excellently too, offering a uniform look that made for a striking scene. Added to this, the London Eye in view, as well as House of Commons and The National Theatre close by, the Southbank is truly a great setting for an event of this kind. 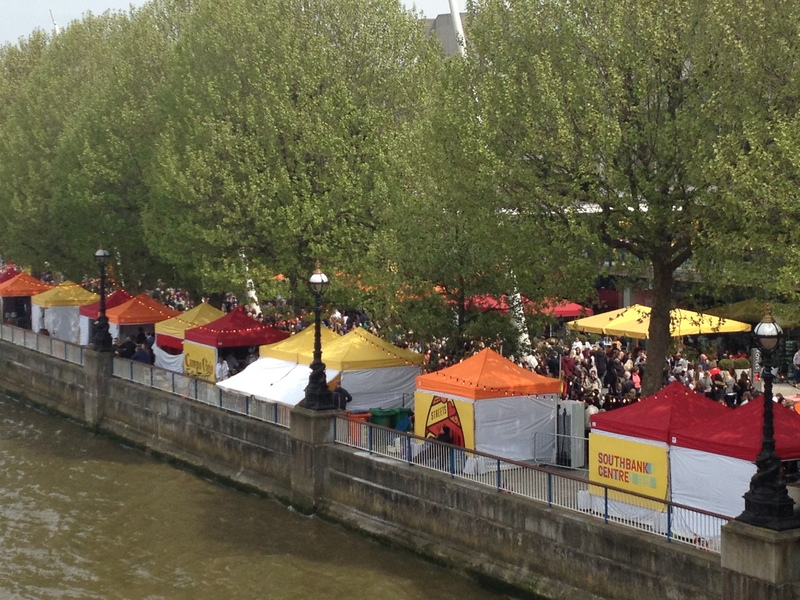 Street vendors alongside the River Thames. A large part of our unconscious mind is used to process the data that our eyes gathers everyday resulting in about a third of our brain handling vision. Evolution has seen to this as a key survival tool to avoid danger and forage for food. This is why we form split-second first impressions via our eyes. Consequently, it’s paramount to provide aesthetically pleasing venues, spaces, as well digital platforms for events and experiential marketing. Thankfully most of us in the business are well aware of this — I hope! The next sense to be tickled was smell; the aroma swirling around the fresh spring evening air was simply amazing. Sizzling beef, spicy pádron peppers, paella, churros, patatas bravas, all providing a smell sensation, which recalled fond memories of a time when I lived in Spain for a year as an inquisitive seven-year old boy. A powerful connection exists between the olfactory system (smell) and memory. For example, research into the subject has provided strong evidence that scent-encoded information achieves far greater longevity with individuals’ memory when compared to other sensory cues. In addition, another study in the area found memories triggered by scent were rated to be more emotional for individuals in an experiment compared with the other senses. The close neural proximity of the system dealing with smell and memory in the brain plays a large part in this strong relationship. For instance, the limbic system is home to the olfactory bulb (which is the area of the brain that processes smell), the amygdala (primary role in the processing of memory, decision-making, and emotional reactions), and the hippocampus (short-term and long-term memory); all of which heavily influence our emotional life and has a great deal to do with the formation of memories. At an event like this, taste is obviously going to be an important sense to invigorate. I was drawn in by the smell and sound of fiery pádron peppers being cooked at a tent selling a dish described as the “Barcelona Bomb”. The ingredients were Wagyu beef served on a baked potato bed, with a sauce similar to alioli, which certainly did blow my taste buds away — delicious. Later I tried some seafood paella, which looked fantastic cooking in a massive dish. Taste, more so than any of the other senses, we experience through those other senses. How something smells, how something looks, how it feels, even how it sounds, all influence our brain’s ability to process what something taste’s like. In particular, up to 80-90% of what we think things taste like are down to smell. This is because our taste receptors are limited by just five primary taste qualities: sour, sweet, salty, bitter and umami. Thus, alone, we can find it very hard to distinguish subtle flavours. This is why clever food-sellers prime our anticipation with lots of descriptive adjectives on menus and pay close attention to a dish’s presentation. 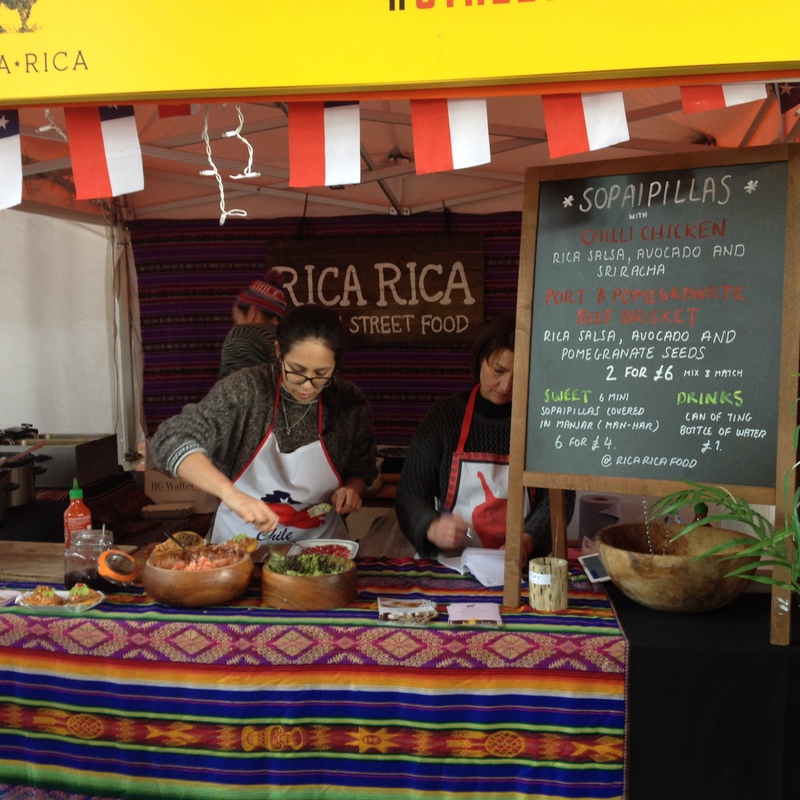 My ears were constantly immersed in the event; it appeared that most of the food tents were run by Spanish vendors, and many Spanish people were in attendance, resulting in the language being heard all over the place, as well as other Spanish dialects. If you closed your eyes, hearing the food sizzling, and the loud noises of people having fun on the street, you could indeed be in Barcelona, Madrid or San Sebastian. A music stage with bands during the day and DJs as night, as well as the Soundscape experiment (discussed below), provided further stimulation for the ears. The significance of audition has been long recognised dating back to the 1950s when marketing and advertising began to sell us desires and wants as opposed to needs. Music jingles, music in T.V. and radio ads, connecting music with spaces such as hotels, retail outlets, restaurants, and airplanes, to create an atmosphere, as well how a product sound, all have been put to use to target our hearing sense in order to have emotional impact and influence behavior. Sound is also a key feature in most events and experiential activity; whether through music or microphone, this is a must to get right, but this is certainly not always the case, sadly. The hustle and bustle of market street. How did the touch fare? Probably the hardest of the senses to plan for in order to stimulate event-attendees compared with the others already mentioned. The main object consistently in my hand was a wine-cup (Well, it is being organised by a wine brand, so no judging please). The cups chosen for the event did give me nightmares. Perhaps it is due to my University days where many a bottle of wine were smuggled into the theatre, cinema or ballet (What, you’ve never smuggled wine in to the ballet?) and all one could use to drink from was a take-away coffee cup that invariably got soggy. Haptics, the scientific term for touch, was believed by Aristotle to be the most highly regarded of the senses. He put it sitting above the other four in a hierarchical fashion set out in his theory, “aistheis”, meaning sensations, due to touch providing a true picture of the intrinsic nature of any given object. Interestingly, touch is also the first sense we experience inside the womb, and the last sense to fleet us upon dying. In infant monkeys, research was carried out to see if a mother’s touch or basic nutrition was more desired. It found that infant monkeys always chose a warm, comforting surrogate mother (warm blanket wrapped around a wire mannequin) over a cold, nurturing surrogate mother (wire mannequin with milk bottle). Moreover, strong infant-parent touching in humans has been shown to increase attachment levels and enhance the baby’s emotional and physiological health. For products, it has long been established that touch is hugely important in how people perceive an item they wish to purchase, with there being both a functional and emotional aspect to touching. They can have fun by touching a product or judging its quality and value. In particular, there exists strong evidence that the mere shape of a wine glass has a direct influence on the taste experience. Hence, my surprise that Streets of Spain had used take-away coffee cups to serve their wine in. I know to serve so many people in a cost-effective way may be the reason, still, I think that plastic cups with which a deposit is given and returned would be a much better system to showcase the wine and create less waste. Inside the Soundscape Experiment room. I was very intrigued by this aspect of the event. It was an opportunity for people to go deeper with the brand and experience something different and new. Soundscape was an experiment into the relationship between sound and taste; the first of its kind in the world. Nick Ryan, a world-renowned pioneering composer, was tasked with interpreting the taste of the wine and creating a musical journey for people to take when sampling a Cava, a Reserva, and a Gran Reserva; which would mimic the condition known as synaesthesia; where the stimulation of one sense evokes the sensation of another. The room provided a feeling of immersion, and four Funktion One speakers aiming at us added to the experience (I love Funktion One sound-systems). Nick created three different compositions to accompany each of the wines. For each of the pieces there were three cues to indicate the stages of tasting: smell, initial taste, and finish. For me, although an intriguing experience, I found the sounds distracting, which made it hard to find my own subjective opinion about the taste of the wine. That being said, I did feel like Nick’s vision of the wine came through the music, which nonetheless, resulted in a very interesting experiment. We experience and interpret life through our senses by physiological methods of perception, so a sense is a faculty by which outside stimuli are perceived. They are a complex mechanism designed to aid our survival — well, back in our more primitive days at least. No longer just for survival, our senses allow us modern humans to seek pleasure in the world. This is why our senses are so important. Now I know what you may be thinking, that these things just happen naturally, and that the senses are as well serviced in an iconic street market such as Borough Market, for instance. However, that is not the point. Experiences like Borough Market have been around for many years, and as a result, have grown a sensory atmosphere organically. For producers of experiences, we need to replicate these types of immersive and authentic atmospheres with limited time and resources. Subsequently, plan for multi-sensory experiences in the design phase, harness their influence, and watch your live events gain deeper emotive and immersive qualities, enhanced memory retention, and ultimately, improve the chances of creating a positive impact on your target audience. Overall, I found “Streets of Spain” to be an excellent example of a well designed and executed multi-sensory experiential campaign. The event felt genuine, paid attention to how our brains works, and created a great platform for brand engagement. Well done to all involved. Look out for my future blog post on the topic of sensory psychology. Get involved by leaving a comment below, or by following me on Twitter where you can find me @eventpsychology.